I just wanted to pop in quickly and thank everyone for a wonderful first year in the fandom. I've had a blast getting to know y'all better and consider your presence in my life a blessing each and every day. *big hugs* I'd like to say more about how rough this year has been for a lot of people and how sincerely I hope that 2009 brings more bright moments for all of us, but someone is growing impatient and wants to "get this bloody party started already!" *throws arms wide* Vampagne for everyone! HAPPY NEW YEAR'S, MY PRETTIES!! MWAH!!! You've made this year so much more fun than the surgeon general allows. Your spaikus and doll!pics have brightened up many a day here at casa Adri. So, thank you for your incredible sense of humor and obsession with dolls. Thank you so much, Adriana! *smooshes you* I'm honored to brighten any day I can. (And everyone knows that the surgeon general has set the recommended daily allowance of humor waaay too low. What a funsucker! Sheesh.) Hope you're having a lovely evening, and Happy New Year to youuuu! *sniff* It's just so beautiful! I second your emotion, sistah! MiAmor says to tell you it's a good think you live far, far away, for your own safety. He thinks he might be a pest, otherwise. Really though, it's the potential damage to your delicate eardrums from all the guffawing. Happiest of happys to you and yours. Bwahaa! Well, rest assured that I would wear my damaged eardrums as a badge of honor. I'm not the kind of gal to look a gift guffaw in the mouth. *frowns* Hmm. That made more sense in my head. Same back atcha! I hope y'all are having a great evening, and I wish you many happy returns for the New Year. Hahaha! You are too great. I wish you blessings this year! Looking forward to more fun, both spaiku and doll!pic! Yep, and this is my first fandom experience. I'm a late bloomer! Thank you! I've really enjoyed getting to know you better this year. Honest to Pete, one can never know too many librarians. Such interesting folks! Happy New Year to you and yours, lady! Happy new year, and I'm glad you're here with the rest of us fangirls! Happy New Year, and I wish you a warm, dry weekend. I'd love to pop his cork...ahem....that said... SO glad you are here and part of our little family. Happy new year! Thank you so much, Kathleen! I'm glad to be here. *whispers* Poor little guy. He's still sleeping off the hangover in the cardboard castle. And now I have to figure out how to get champagne stains out of the ceiling. Marvelous! Happy new year to you, chica! You've brightened many a day with your spiffy sense of humor and your spuffy sense of the ridiculous. May 2009 come up roses for you and our favorite plastic vampire. 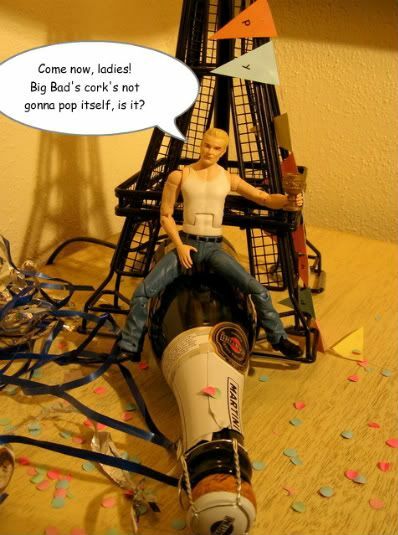 Perhaps if he pours enough champagne into one of the ever-elusive plastic Buffy's, she will brighten his new year. Currently, bugbug has talked Grandpa into playing the Wii. She, Grandma and Grandpa were jamming earlier on Wii Music, but Grandma pooped out and she talked Gramps into Wii Play. She'll probably outlast us all in staying up till midnight. Thank you, sweetie! Hope you had a great day. Ha! I had a devil of a time staying up until midnight, but Z. was all over it. *sigh* I'm ooold. Thank you, ma'am! Hope that 2009 is treating you well. Happy 2009 to you and yours! Let's hope that this year bring good things - and good health - to all of you. Thank you, dear! Hope that 2009 is treating you well so far. All the best to you and your loved ones, Mere! Happy New Year to you and yours! *hugs galore* Hope that 2009 is treating you well so far. Only a year? It feels like I've known you forever. Your creativity inspires us all. And I've loved getting to know you. Have a wonderful and even more creative new year! Aww, me too! I can't imagine how I got along without my LJ friends before. I've had a wonderful time getting acquainted with you this year. *lol* Thank you! I'm glad that the rude humor is good for something besides alarming my coworkers.